Joely Richardson was dressed in festive red as she stepped out for the world premiere of her new film Surviving Christmas With The Relatives. 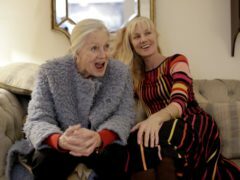 Actress Joely Richardson, who used to queue overnight for Wimbledon tickets, will be in the Royal Box on Tuesday. Birds of a greying feather squawk together in writer-director Roger Goldby's gently effervescent road movie that reimagines Thelma & Louise 30 years later with dodgy hips, walking sticks and nagging regrets. MAGGIE unfolds in a bleak, colour-bleached future ravaged by a deadly contagion, which takes six to eight weeks from infection to transform a healthy human host into a monstrous husk, capable of spreading the virus with a single bite.